It was a rainy weekend so I went to the movies for some escape. The trailer for The Promise had caught my eye as it included actors like Oscar Isaac and Christian Bale and it took place during WWI. It was on my radar, the time was right, so I went to go see it at the theater and I was not disappointed. This is a great little piece of cinema. The movie takes place in Turkey during the beginning of World War I and follows an Armenian named Mikael Boghosian (played by Oscar Isaac) who goes off to learn medicine in Constantinople. Isaac is the star of the film and is the focus throughout as it follows his story. From being betrothed to a woman in his village, leaving to go learn how to be a doctor, falling in love with another woman, and then getting caught in the violence of the Turkish genocide against the Armenians. The film follows Mikael as winds up in a labor camp, flees, sees first hand the holocaust committed against his people, and then tries to save the ones he loves as they head to the mountains for a last stand. It’s a deeply touching film about love, integrity, and the horrors of human civilization. Acting wise, Oscar Isaac gives an outstanding performance in the lead role and is backed by a great supporting cast. Charlotte Le Bon plays the woman he falls in love with in Constantinople, Christian Bale plays an American reporter and is part of the love triangle between Mikael, Ana and Chris. There is a whole host of smaller parts played by Shohreh Aghdashloo, Angela Sarafyan, Tom Hollander, Igal Naor, Rade Serbedzija, James Cromwell and even Jean Reno. Combined with the excellent cinematography bringing the scenery to live, and the great story, it makes for an excellent film that’s definitely worth seeing. 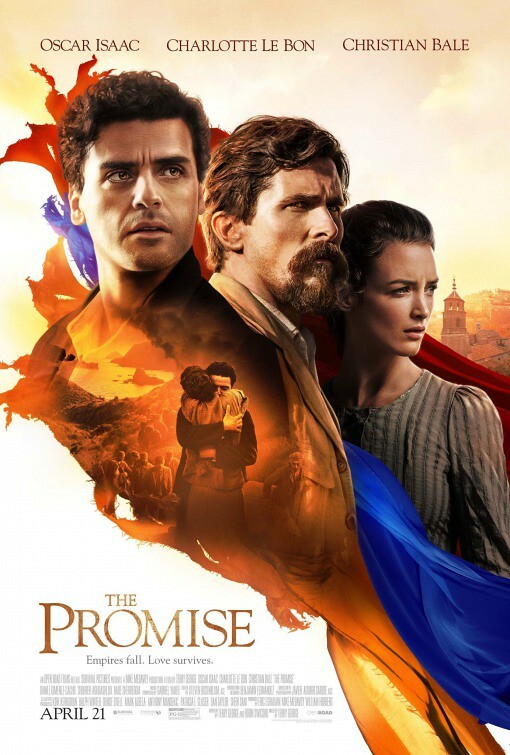 It’s part love story, part history and part drama as it tells one man’s winding path through life and sheds light on the Armenian genocide. I give The Promise a five out of five metal bikinis.